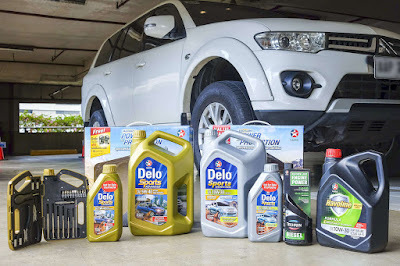 Caltex, marketed by Chevron Philippines Inc., (CPI) gives Filipino motorists and a new reason to enjoy driving, whether it be in the city or off road in the countryside. CPI today released its new line of advanced engine oils specially formulated for maximizing engine life while maintaining high power and performance even under the most severe conditions. Formulated with ISOSYN Advanced Technology, the Delo Sports Advanced SAE 5W-40 is a super-premium quality “low SAPS” (sulfated ash, phosphorus, and sulfur) synthetic diesel engine oil that provides ultimate protection for sport utility and sport activity recreational vehicles, high-performance pickups and 4x4 type vehicles, including those with the latest low emission diesel engines. For gasoline engines, the Havoline Formula SAE 10W-30 has what it takes to keep young drivers going. A resource-conserving, multi-grade gasoline engine oil, it is specially engineered with Deposit Shield Technology, an advanced detergent formula unique to Havoline products that prevents deposit buildup and caters to passenger cars and light commercial vehicles requiring low viscosity. The viscosity grade 10W-30 is designed for fuel efficiency and a popular grade recommended for Japan and American car models. With more cars with lower engine displacements rolling off showrooms each year, Havoline provides a significant investment for first-time car owners and a perfect protection for hard-earned money. The Havoline Formula SAE 10W-30 is easy on the pocket but big on benefits: The stop-and-go city driving on the way to work or the highway cruise to the next destination on the bucket list are now worry-free trips with Havoline under the emission system and turbocharger protection. The Havoline Formula SAE 10W-30 (P 1,070 for a 4-liter bottle or P 270 for a 1-liter bottle) and Delo Sports Advanced SAE 5W-40 are sold in the nearest Caltex stations, auto supply shops, leading hardware stores, and even online. Get a free limited edition of Delo Sports tool set with every purchase of 6+1L Delo Sports Advanced 5W-40 promo pack (P 4,980). Save P 150 when you buy a 6+1L Delo Sports Synthetic Blend 10W-30 with Techron D Concentrate bottle promo pack (P 2,980).